This ‘Shrimp in Mayo Sauce with Peaches’ dish, which contains ingredients, such as condensed milk and mayo that don't seem so harmonized until you try it. You will then agree that these two ingredients and shrimp work so well together. Tossing with the mayo sauce, it doesn't ruin the crunchy coating of the shrimp at all. The peaches also play a big role in this dish. They add a fruity taste to it. No wonder every time when I am in a Chinese restaurant, I frequently see customers order this dish. I really enjoy this great recipe, and I have never failed with it. Dry shrimp with paper towel. Set aside. Mix all batter ingredients in a bowl with whisk or fork until smooth. 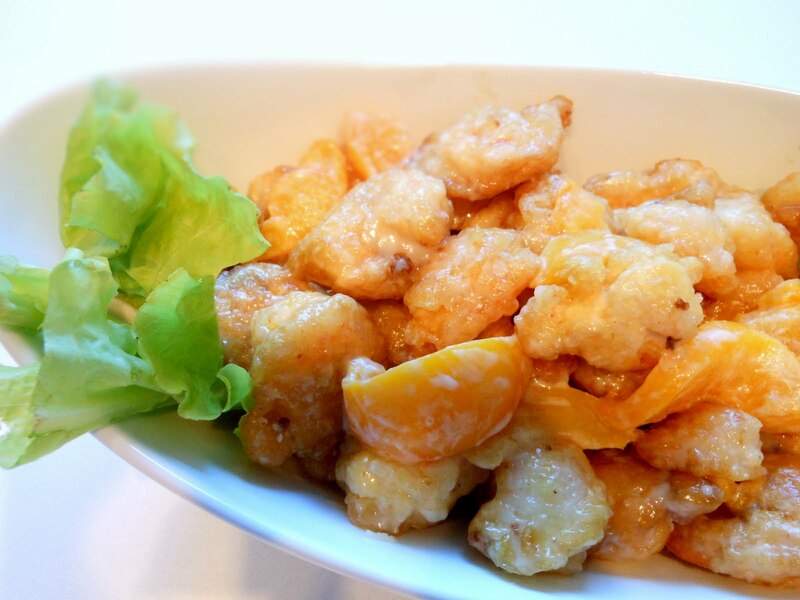 Dip shrimp into batter and drop the coated shrimp into the hot oil one at a time over low heat. Fry until both sides turn gold but not dark brown. Remove from oil and put them on a plate lined with paper towel. Put the fried shrimp into a pan over low heat and toss in sweet mayo sauce. Add peaches, toss again slightly. Remove from heat and transfer to a serving plate. Serve immediately. I could eat 4 servings of this and want more...I LOVE shrimp any which way but this way looks particularly divine!! I can't wait to try this I had it at a restaurant and they served it over crunchy noodles, do you know what kind of noodles they may have been? I love this recipe. I cooked this for my family and we all loved it. This is my favorite way to prepare shrimp. Thank you for the recipe. Hi Sherry, Glad that you love the recipe! Thanks for visiting my blog!